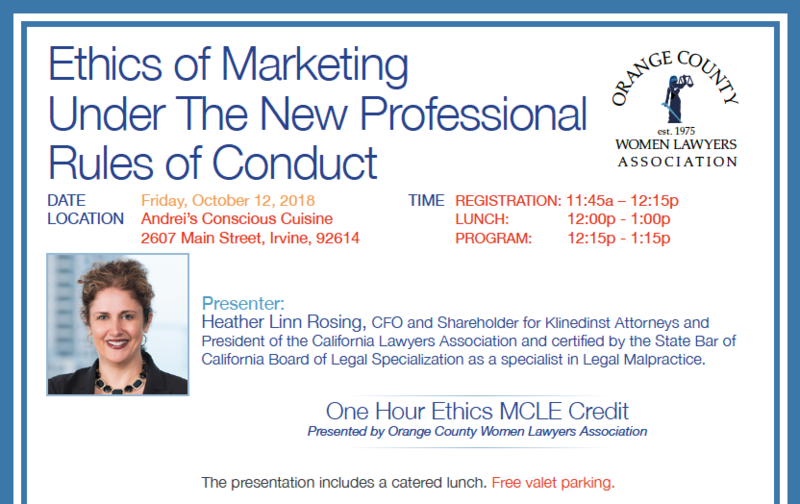 Speaker: Heather Linn Rosing, CFO and Shareholder for Klinedinst Attorneys and President of the California Lawyers Association and certified by the State Bar of California Board of Legal Specialization as a specialist in Legal Malpractice. The presentation includes a catered lunch. Free Valet Parking at Andrei's with event registration. *Note: No registration refunds are available within 72 hours of OCWLA events; however, an event ticket may be transferred to another individual for the same event as originally purchased. Late RSVPs are subject to a $5. fee.